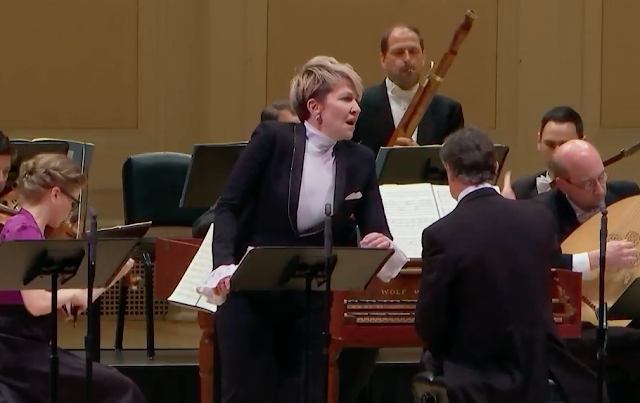 Joyce DiDonato sings Ariodante at Carnegie Hall. with Harry Bicket (seated at keyboard) at Carnegie Hall. Image © 2017 Medici.tv. Joyce Di Donato has had a mercurial rise in this decade. The Kansas City mezzo-soprano is equally at home in bel canto and the high baroque, coupling her talent with a friendly yet regal demeanor that makes her in demand around the world. On Sunday afternoon, Ms. DiDonato joined Harry Bicket and The English Concert for Ariodante at Carnegie Hall, singing the title role as part of her residency at that august institution. The entire performance was broadcast live on Medici.TV. Ariodante was written in 1735 at the height of Handel's successful run as the leading opera impresario in London. Its libretto is taken from the Italian epic poem Orlando Furioso, telling of the interrupted courtship of the lovers Ariodante and Ginevra, and the efforts of the dastardly Polinesso to destroy his rival and take over the kingdom of...Scotland? Yes. Why not. Scotland! The plot has some similarities to Shakespeare's Much Ado About Nothing, particularly in Polinesso's method of stirring Ariodante's jealous rage. Ms. DiDonato was clearly the star here. Her crystalline delivery and bright tone captured Ariodante's mercurial nature in the three great arias. In Act I, "Con l'ali di costanza" showed the knight's goodness and nobility. In Act II, the anguished "Scherza infida" showed Handel's ability to sustain emotion and break hearts. In the third act, "Doppo notte" was a pure virtuoso showpiece, its second da capo section allowing Ms. DiDonato to reveal the full and florid nature of her talents. The role of Ariodante was created for the castrato Giovanni Carestini. But his intended, Ginevra was created for Anna Maria Strada, Handel's new leading lady at Covent Garden. Soprano Christiane Karg impressed in this short but crucial part, singing in a glittering high register. More impressive was Mary Bevan in the crucial role of Dalinda. She starts the opera as Polinesso's cat's-paw, and becomes the opera's secondary heroine once the plot swings into motion. Mention should also be made of bass Matthew Brook, whose performance as the Scottish king had both resonance and emotional power. The best supporting player was the contralto Sonia Prina. Their androgynous appearance, steely stare and swaggering walk made Polinesso a memorable bad guy. And then they started singing, unleashing floods of half-step melismas that stunned the listener and showing both power and endurance in this difficult role. With spectacular low notes and a thrilling middle register, Ms. Prina caught the guts of this arrogant character. The best compliment of all is that their death (in the combat arena at the hands of the evening's tenor) lowered the energy level of the final act, though not to a fatal degree. Tenor David Portillo is another quick-rising star. His agile instrument and bold, slightly oblivious stage presence suited Lurcanio, playing the second leading man as a lovable lunkhead who finds himself as the drama unfolds. His best moment was the fiery "Il tuo sangue" which set up the opera's central crisis while unspooling bright and fiery displays of ornamentation. He found his lyric side in the Act III duet "Dite spera, e su contenti" where he marries Dalinda, the bad girl who was the pawn in Polinesso's scheme. Mr. Bicket led his period forces in a taut account of this sprawling score, with natural horns, oboes and recorders providing authentic instrumental color. This is a long opera, and his players showed grit and experience, creating fresh and endlessly inventive instrumental textures to depict changes of scenery and theatrical effect on the bare stage of Carnegie Hall. This period ensemble remains one of the finest in the world, and this writer can't wait to hear which Handel opera they plan to tackle next.